I lived off Donegal Park Ave in Downview Gnds. Remember the Milk Bar in Greencastle. Was that Pootsys American Soda Bar at the bottom of the Whitewell Rd.? yea, hells angels and bikers used it as there hang out. i remember going at lunch time from Graymount to the soda bar, we got a half pint glass of apple juice and told everyone we had cider!!! good times. So you're a Graymount girl Jan? Could someone please tell me if Depot Tce. is in the Shore Rd. Area, and is the street still there? Also would anyone have a street directory,detailing the people that lived there in 1950 or 1951? Hi Newry, Depot Terrace isn't a street. It is [or was] a terrace of about 7 Victorian houses with attics, on the main Shore Road next to the old tram depot and where the Fortwilliam trolley bus turned. It was still standing, but with the houses bricked up, when we were last in Belfast in 2010. I believe the terrace has been more or less derelict since the mid 80's just waiting on one resident moving out. We lived there from 1966 to 1975. Belfast street directories are, I believe, available to view on line. Thanks for the reply.I believe I was born in the Terrace but don't know the number. the times and places they lived in. occasionally in my childhood.The photos also are invaluable.I hope this makes sense. seaviewite.....the one house occupied is owned by a wee man called hammy hamilton, he used to work for the fire service NI. The house looked boarded up to me. I remember the Hamiltons, I think most were a wee bit odd and the man living there now would be a bit of an eccentric. I remember old Da Hamilton, as we called him, coming along the road on a friday night drunk and singin' his head off. Another memory of Da Hamilton was of him settin' the house on fire as he was cleaning his bike with petrol in front of the open fire. I don't think they ever really got it fixed up properly after that. Sad really if one of the sons is still living there in those conditions. eccentric, is the right word or absolute nutters. lol.....don't no if he's still their, i will look next time i'm passing. I believe I was born in the Terrace but don't know the number. 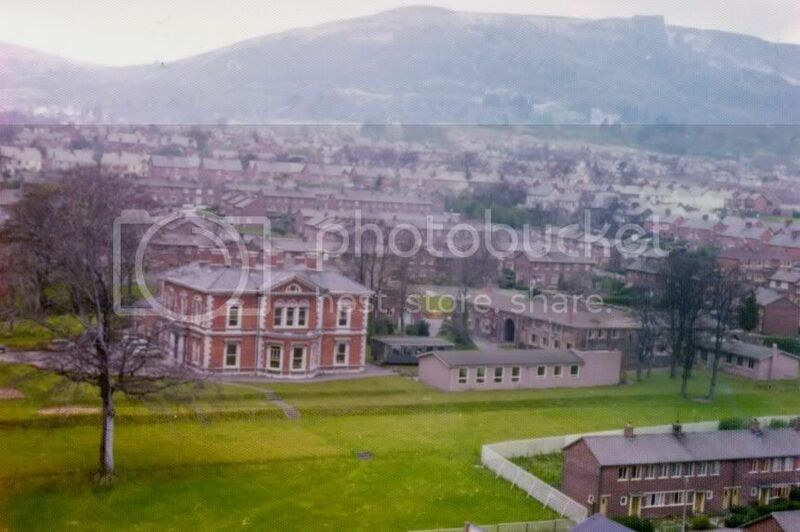 newry, this is Depot Terrace. I took this picture in 1990. 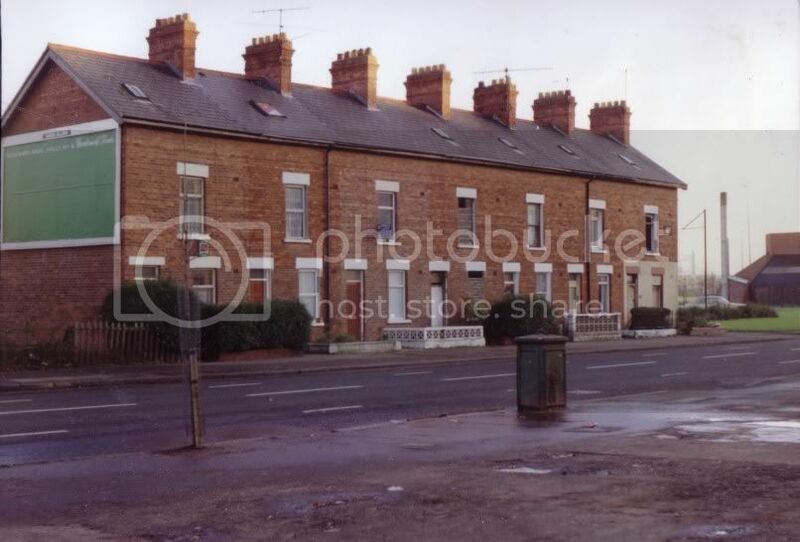 Circle Taxis occupied the house at the far end of the picture, for a while, late 1970s/ early eighties. I knew the Hamiltons who I believe are still living in a house in the middle. The house at the end that is shown "For Sale" was ten and a half thousand, and I actually went to see it because I love old buildings. It was quite roomy inside and if I remember rightly a man had been renting it and had died in it. There were two attic bedrooms with fireplaces and windows in the roof. I have one of the tram depot beside it if you want me to put that on too. I can't remember whereabouts on the forum I saw a photo. request for Mount Vernon school, but anyway here it is. My Mother worked in it and I knew some of the staff and pupils. It was absolutely gorgeous inside and the old courtyard at the back was very atmospheric. My Mother once heard a very strange set of sounds inside the school when she was alone working, and when she told the caretaker, he remarked that other people had heard the same thing in previous years. She said it was a whistling sound followed by a thud, as if a bird had come down one of the chimneys. However, the sound repeated itself immediately after which seemed to rule out the bird theory. Happy memories to you all who recognise this old landmark. I certainly enjoyed the freedom of the place and often sit down and recall the details with fondness. There was a window in the front of the house which was an architectural feature for symmetry. The same window did not exist in the upstairs room it appeared to be serving.